Choosing a theme for your high school graduation party helps pull the event together and highlights something unique about the graduate. Forget the standard themes you see at every party and make yours stand out with a unique set of decorations, menu, and even guest costumes. For a truly unique graduation party, look for pop culture phenomena to inspire everything from the plates to party games. Whether you're inspired by the book, the movie, or virtual reality (VR) gaming, this theme is cool and timely. The setting is the future, specifically 2045 in the book, so you can play off that theme too. Send virtual invitations instead of snail mail. Ask players to dress as a video game character or wear name tags with their gaming name instead of their real name. Have a VR experience available for guests to try out. Nearly everything that's important today gets posted on Instagram in a catchy photo. Using the iconic Instagram logo and screen design you can create a fun event centered on pictures. Include a DIY photo booth with props where guests can make new memories. Create a custom hashtag for the party so everyone can post pics on social media. Use empty picture frames on the buffet table to highlight individual dishes. Get decorations and paper goods in the Instagram logo colors of yellow, orange, red, pink, purple, and blue. The Harry Potter franchise is a never-ending source of inspiration for readers and movie-goers of all ages. The Fantastic Beasts movies feature strange and unique creatures known and rare in the magical world. Decorate with images of mythological creatures, but replace their faces with images of your graduate and their classmates. The main character in the movies keeps magical creatures in a brown suitcase. You can use antique suitcases of all sizes to house plates and cups or add dimension to the buffet table. Ask guests to dress as their favorite character from any Harry Potter movie or the Fantastic Beasts movies. Serve foods and drinks found in the franchise such as butterbeer or strudel. Zombies are popular in almost all aspects of media from TV to video games. Plan a "You Killed It" party full of zany zombie inspiration. Have guests dress as zombies. Serve dishes that look like brains, such as pasta or a brain jello mold, since that's what zombies eat. Decorations should look disheveled and torn like the clothes zombies often wear. Technology rules the world, so why not let it rule your party? Celebrate your high school success with hopes to "copy & paste" that experience into a successful college or adult life. Serve up food and drinks that look like exact copies of each other, but have different flavors. For example, a strawberry lemonade and a raspberry soda are about the same color. Ask guests to choose a partner and dress as twins. Use the "Ctrl" and "V" keys of a keyboard or images of them as decorations. This Netflix series has a cult following and works well for a grad party because it features the real world and another dimension which could symbolize high school life and adult life. Use colored Christmas lights to spell out "Congratulations" on the wall similar to an iconic scene from the show. Separate rooms of the venue with black plastic over the doorways where guests have to push through a gap in the middle of the doorway to enter the next dimension. The show takes place in the 1980s so use popular things from that decade as decorations. Serve Eggo waffles, the iconic food eaten by Eleven, and other foods from the show such as tater tots, Coca-Cola, and tuna noodle casserole. Create your own Coachella in the backyard by highlighting the music festival vibe for one last night of fun with high school friends. Set up distinct food areas such as a coffee shop and Asian section or hire a few food trucks for the event. Get a live band to play the party or, if possible, lineup several bands throughout the night. Set up fun art activities where guests can throw paint-filled balloons at a white sheet or something similar to create a memorable keepsake for the graduate. If your graduate has a great sense of humor, try out a funny party theme. As you move from high school senior to college freshman, you'll be "changing hats." Invite guests to wear different kinds of hats. Serve chips and dips in upside-down plastic hats. Decorate with coat racks or hooks around the event and hang different types of hats on them. Take a glimpse into your future with a psychic graduation party. Hire a psychic or two to give free readings to guests. Give out graduation year sunglasses to show that your "future is bright." Decorate with light, see-through fabrics reminiscent of a psychic's crystal ball table. Use snow globes as centerpieces to mimic crystal balls. You survived high school by being an extreme survivalist. Plan your party around shows like "Survivor" or "Naked and Afraid" (minus the naked part). Choose an outdoor venue in or near the woods or another extreme landscape. 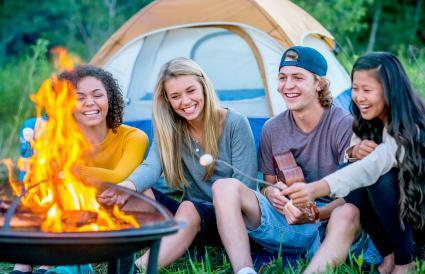 Serve classic camping foods like S'mores cooked over a live fire or dehydrated and freeze-dried food options like survivalists use. Use shades of brown and green for your color scheme. Host a nighttime graduation party filled with glow-in-the-dark decor. Hand out glow necklaces and bracelets to guests and ask them to wear reflective clothing. Use LED candles under colored plastic cups to help light up the food table. Get wireless speakers that feature lights to add visual effects. Celebrate your baby growing up with a baby themed graduation party. Hang baby pictures of the graduate around the venue. Print out baby clip art and replace the cartoon faces with your teenager's face. Serve drinks in baby bottles and snacks in empty baby food jars. Life as an adult can be daunting with mortgages, bills, horrible bosses, and taking care of kids. Let your party serve as a humorous introduction to the "real world." Give guests play money and charge high prices for everything from drinks to using the restroom. Serve make-your-own foods and drinks guests have to assemble on their own such as a taco bar. Decorate tables with mismatched tablecloths and plates since most young adults can afford elegant matching sets. Classic party themes feel nostalgic and sentimental. Personalize your event by choosing a classic theme that isn't overly common. 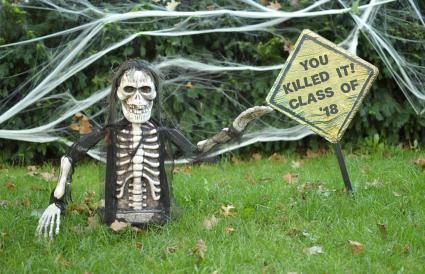 Use old school-related items as decorations for your "old school" party that celebrates old high school ways. 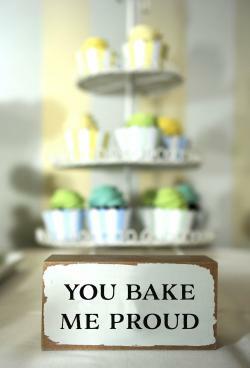 Make directional and food signs out of chalkboards. Decorate tables with wooden yardsticks, an abacus, and even antique school books. Serve classic cafeteria foods such as pizza boats, juice cups, and individual milks. Let inspirational words be the literal basis for all your party decor. Supply permanent markers and ask guests to write encouraging words on the tablecloths. Serve foods inspired by funny sayings or puns with explanatory signs such as a relish tray with the sign "I'm kind of a big dill." Decorate with banners, prints, and wooden signs featuring famous inspirational quotes and sayings. The classic board game "Life" makes great inspiration for what's to come after high school graduation. Ask guests to wear all pink or all blue to resemble the game pieces. Make each table a different spot from the game board by decorating a plain plastic tablecloth with markers. Use bright colors from the game like pink, blue, green, and yellow for the color scheme. For teens who don't have an after high school direction yet, a road sign theme perfectly captures this dilemma face by many graduates. Using classic road sign shapes and colors such as a red stop sign or mustard square sign to label foods and activities. Serve fast food options or classic diner dishes to symbolize stops you'd typically make on a road trip. Use maps as tablecloths or placemats at guest tables. High school was only one chapter in the book of your life; celebrate what might come next! Write your name and the words "next chapter" on the cover of a blank notebook and leave it where guests can write wishes for your next chapter in life. Decorate with books or book pages on tables or made into hanging banners. Serve foods from famous book titles such as James and the Giant Peach, Fried Green Tomatoes, or The Grapes of Wrath. Some say after graduation the world is full of open doors. Decorate with fairy doors, which are little wooden, clay, or ceramic doorways meant to decorate a fairy garden. Serve foods with the words "door," "key," or "lock" in their names such as key lime pie and bagels with lox. Ask guests to attach a note to an antique key that you can put on a large keyring as a keepsakee after the party. In the world of teenagers, high school graduation is akin to the championship game they've worked their whole lives for. Serve foods in cup-style trophies. Decorate with a gold color scheme to represent the gold medal. Serve classic sporting event foods like hot dogs and nachos. As you potentially move away from home after graduation you'll have the chance to see other parts of the world. Start your adventure right now with your graduation party. Set up food stations inspired by different regions of the world like Asian, Latin, and American. Decorate with flag designs from countries around the world. Set up a photo booth with props representing styles of dress from different cultures such as a sombrero, beret, or kimono. 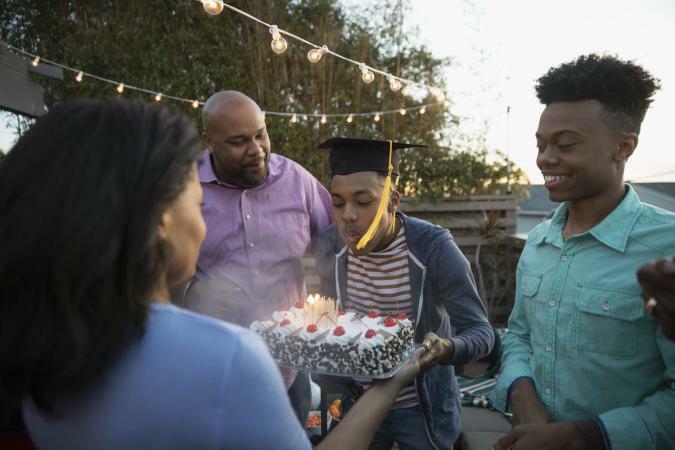 If you don't have a lot of time or money to spend planning an elaborate graduation party for your son or daughter, there are plenty of quick and easy themes to choose from. School Spirit - Buy paper goods in the school's colors and include ask guests to wear school spirit gear from their Alma Mater. Cap & Gown - It's easy to find decorations with the iconic graduation cap or gown on them. All About You - Feature pictures of your graduate from every year in their life with a focus on milestones and achievements at each age. Use monograms of the graduate's initials for more personalization and for a funny twist ask guests to dress up like the graduate. Backyard Barbeque - A classic family picnic never goes out of style. Opt for red and white checkered tablecloths, ask everyone to bring a dish to share, and set up backyard games to play. Graduation Tailgate - Create a party around everyone's tailgate by asking guests to park in the yard, a parking lot, or a field with the back of their vehicles facing the same direction. Each person can bring special drinks or snacks and set up their tailgate party section. Graduating from high school is a milestone and momentous occasion in the life of your teen. Celebrate their achievement with a graduation party theme that fits their personality and favorite things.